Who needs science fiction when reality keeps getting weirder and weirder? The latest rocket from Elon Musk's SpaceX has delivered an experimental floating robot to the International Space Station that looks more like something out of a sci-fi flick rather than reality. The experimental robot has been named Cimon for Crew Interactive Mobile Companion and it is intended to act as "an AI-based assistant for astronauts". Cimon weighs in around 4kg but in zero gravity it won't have any problem staying afloat and 14 internal fans will help it navigate its surroundings. The creators of Cimon are seeking to find out whether robots and astronauts can collaborate together in space. Cimon is equipped with microphones and cameras which will help it recognize it's assigned partner, German astronaut Alexander Gerst. Cimon is powered by an IBM "brain" which hosts its experimental AI programming. The robot also comes equipped with a "kill switch" of sorts which can be used to put the bot in an offline mode to avoid streaming any private moments to Earth servers. The rocket delivering Cimon to its new home took off from Nasa's Kennedy Space Center in Florida at 05:42 Eastern Time Friday. The robot was a part of a resupply shipment weighing nearly 2.7 tonnes that included supplies for the space station such as food and water. The cargo itself is contained inside a Dragon capsule that will detach from the Falcon 9 once in space and dock with the ISS on Monday like a scene out of Star Wars. IBM engineer Matthias Biniok said, "Right now our main mission is to support the astronauts with their daily tasks to save time because time is the most valuable and most expensive thing on the ISS." 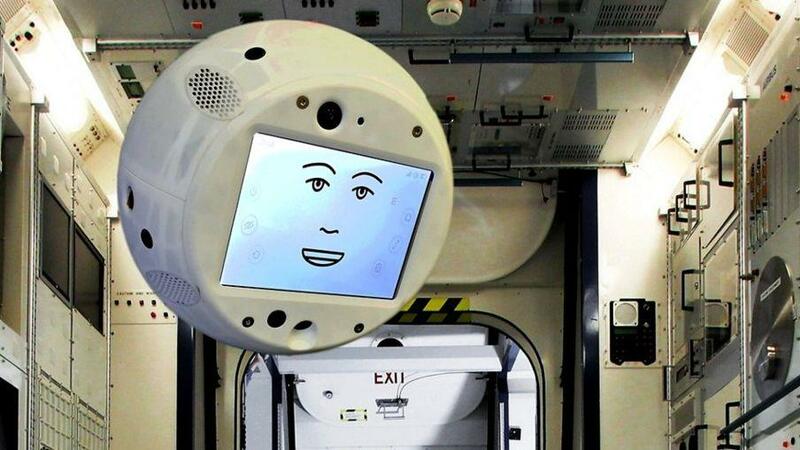 Cimon speaks English and was developed by Airbus and IBM for the German national space agency, DLR. AI expert Noel Sharkey at the University of Sheffield said, "The use of artificial intelligence in assisting space flight is an obviously good use of the technology. It is only in the experimental stages at present and if it is not useful, no space agency will want to waste incredible valuable space with it."